Hello my crafty friend. It’s time for The Rabbit Hole Designs‘ new release and I’m so excited to show you what I’ve been making with the adorable new stamp sets! This time around, they are doing things a little different. Instead of teasing you with stamp sets you can’t buy until the end of the blog hop, they are available right now, from day one!!! 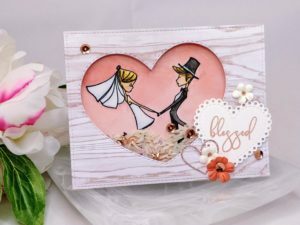 Today, I’m showing you a pair of cards I made using the Happily Ever After set. Isn’t it a beautiful set? And it’s a huge 6″ x 8″ set! The images are gorgeous and the sentiments can be used for lots of other cards too. For today’s cards, I made a pair of shaker cards that are filled with sequins and rice. Birdseed would be equally nice to use as filler, as it is also often thrown above the heads of newlyweds. For my first card, I used a design I’ve made in the past, I just changed up the stamps and colors to make a card with a completely different feel. I love this layout. 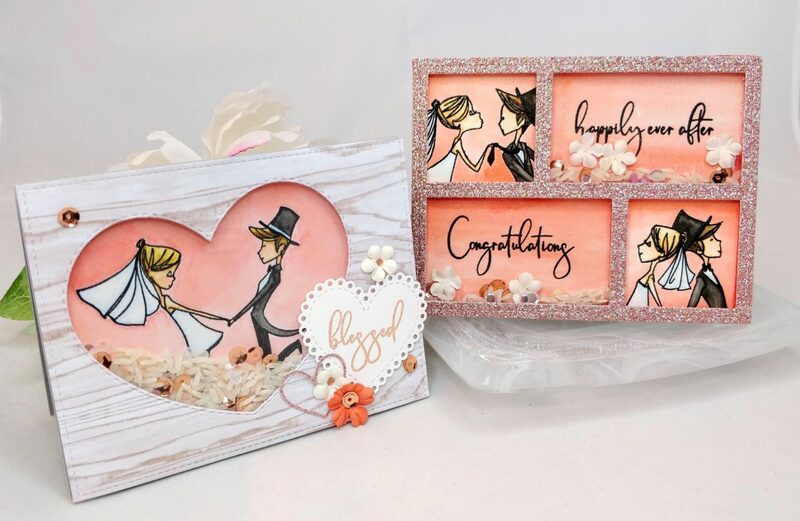 The large heart die leaves the perfect sized window for the happy couple, and the two smaller hearts fit nicely down in the corner with a sentiment. Here, I dressed them up with a few paper flowers and some of the same sequins I used for shaker filler. 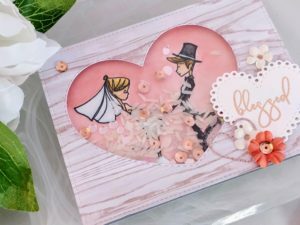 I stamped the couple with Versafine Claire ink and embossed with clear powder. The raised edges of the embossed image formed a bit of a dam that made watercoloring with my Primas really easy. After they were painted and dry, I painted the background with Twinkling H2Os in Persimmon. It is a beautiful color with a soft gold sheen to it. 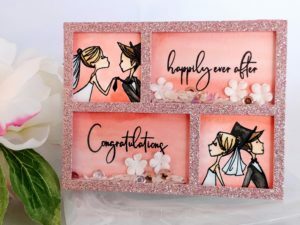 I embossed my sentiment with rose gold embossing powder to match and I added details to the center of the white flowers with a rose gold gel pen. Inside the shaker window, the filler consists of rice, clear sequins, heart shaped sequins, micro beads, and rose gold sequins. The bling on this card is slightly subdued, but really is beautiful as it catches the light. For my second card, I used a frame die to cut the border for a double shaker card. I was inspired by my friend Lynnea, who recently created a double shaker. 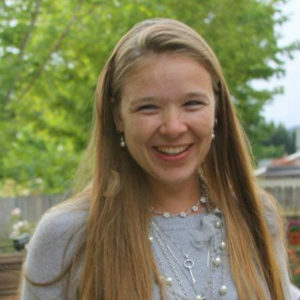 If you’re following along in the blog hop, you just came from her site. You’ll definitely want to go back to check that one out! For my card, I stamped and embossed the images and sentiments just as I did in the previous card and again painted them with Primas, and watercolored the background with the same Twinkling H2O. Under the pink glitter paper frame, I adhered the acetate windows in place over the two largest openings. I popped the frame up with two layers of red fun foam, also die cut with the same frame. The red foam isn’t visible when looking straight on, but at a slight angle, it starts to show and really adds a lot of dimension to the color of the background. It almost looks like it’s glowing. This time, I used the same filler as above, adding in a few white paper flowers. The windows are large enough to allow room for the flowers, and still keep the sentiments visible. 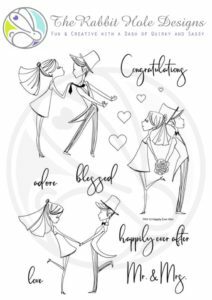 To celebrate day 1 of the release, The Rabbit Hole Designs is giving away the stamp set Happily Ever After to one lucky winner. Winner will be chosen at random from the comments left on participating blogs, so make sure to visit each stop and leave a comment. Leave comments by 11:59 pm PST 03-28-2019 on all participating blogs. Winner will be announced on The Rabbit Hole Designs blog 03-29-2019. Martha Lucia Gomez — Next stop! Gorgeous cards! 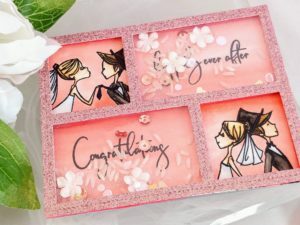 Very creative use of rice with the wedding theme. Oh my goodness! Not only do I love the colors, but I love the idea of putting rice as part of your shaker element. Genius! Loving your cards Amanda! Rice in your shaker, genius! Love how you incorporated every image from the stamp set too! Wow, fabulous designs. Love the colors you used and the new cute images. Wow!! Your cards are absolutely gorgeous!! Love the double shaker… but really I can’t pick a favorite. They are both fabulous!! Amanda, your cards are totally stunning. I love how you used the rice! You’ve done it again. My gosh these are cute. I LOVE the frame of images. Adorable. The shakers are just great. I like how one area is just shaker, to let the eye sort of rest. So far this is my favorite. Love both cards…never thought to add rice, clever. Just too cute! Lovely color! Such amazing shakers! I love the colors! I love this stamp set! Love the rice in the shaker, how clever!! Love your color scheme. Beautiful cards and shakers. I love everything about both of your cards!! These are beyond awesome! The second is my fave with those sneak peeks of them! I think this is the cutest card I have ever seen! Oh my goodness! I LOVE your shaker cards! They are beautiful! I really love the glow from the red foam in your double shaker card and the idea of using rice is also wonderful! Thank you for sharing!! These are both so beautiful, I was already swooning over them on Instagram! Your cards are so amazing. Thanks for inspiring me. Rice in a card? That is genius. Both your designs are gorgeous. Love the shaker card! So going to have to Case this. Awesome shaker cards! Love the colors!